ARRR! 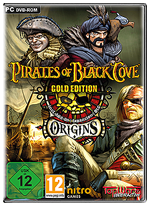 Pirates of Black Cove Gold Edition has been released by TopWare Interactive! The Gold Edition also includes the popular Origins DLC! Light Strategy Adventure for PC. During the golden age of Pirates at a time when the Caribbean is terrorized by the Pirates of Black Cove, it is your destiny to unite all three Pirate factions and become the King of All Pirates. Roam the open World with your pirate crew and seek out and complete missions. Select your character from several different Pirate Captains, each with their unique skills and features! Battle it out with Pirates of Black Cove and European colonists on both Land and Sea. Discover the non-spoken myths of the Caribbean. Gain experience and Fame and Become the King of All Pirates!